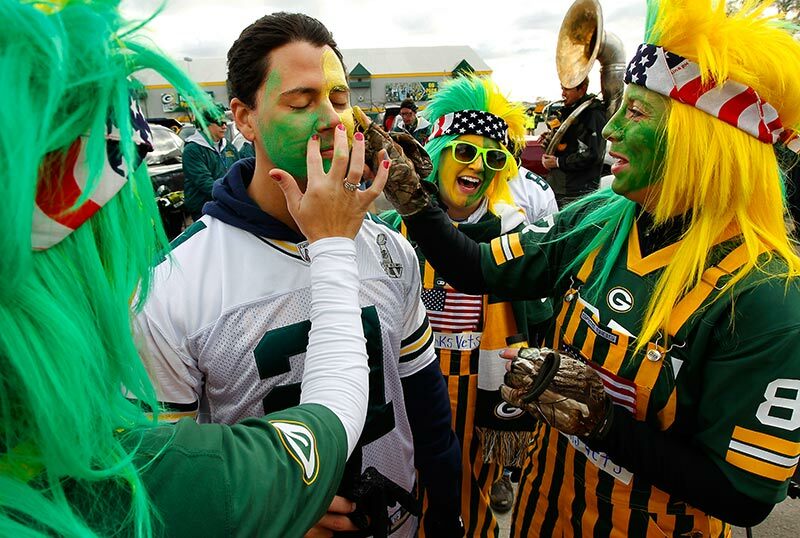 The Green Bay Packers lost their second home game in six days at Lambeau Field on Sunday Novemeber 10, 2013. The Philadelphia Eagles defeated the Packers 27-13. This was the first time the Packers lost two consecutive home games since 2008. 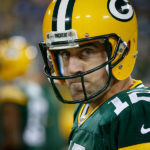 In the first game the Packers lost to the Chicago Bears and also lost quarterback Aaron Rodgers to an injury. 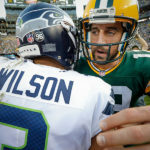 In the second game the Packers lost backup quarterback Seneca Wallace to a groin injury. 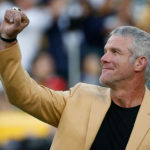 The Packers have only started four different quarterbacks in the last 20 years and will start their third quarterback of the season next week when they face the New York Giants. I was happy with the way I told the story of the day. I got a fun tailgate feature, some interesting detail shots before the game and most of the key plays during the game and then a nice celebration by the Eagles at the end of the game and Green Bay Packers quarterback Scott Tolzien with Aaron Rodgers watching helplessly in the final minutes of the game. Here are some of my favorite photos! 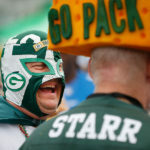 Green Bay Packers fan do a little face painting in the Lambeau Field parking lot before the game. 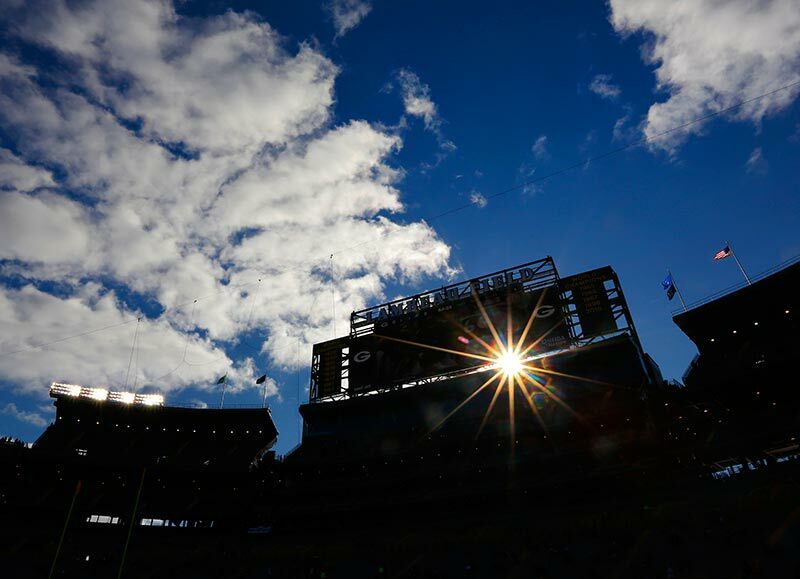 The sun sneaks through the new upper deck at Lambeau Field before the game. 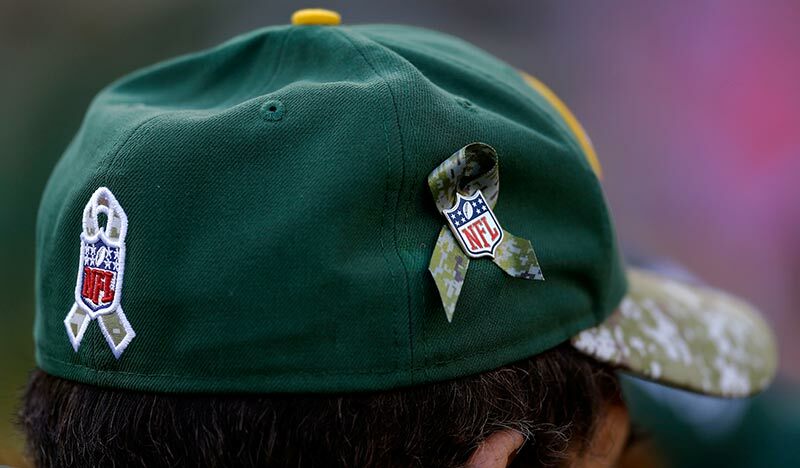 Packers defensive coordinator Dom Cappers sports a pin on his hat to honor the military. Green Bay Packers quarterback Seneca Wallace looks for a receiver early in the game before going out with a groin injury after the first offensive series. 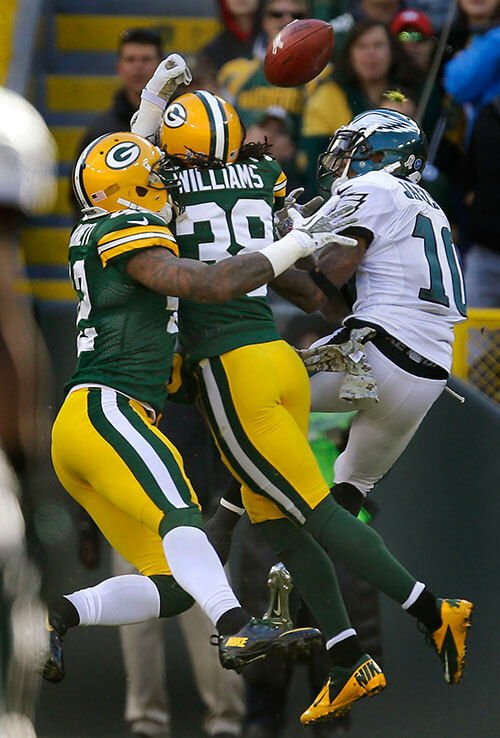 Philadelphia Eagles wide receiver DeSean Jackson looks to pull in a touchdown pass after the ball bounces off Green Bay Packers cornerback Tramon Williams helmet. Green Bay Packers defensive end Datone Jones celebrates a sack. Green Bay Packers quarterback Seneca Wallace stretches on the sidelines after leaving the game with a groin injury. Green Bay Packers wide receiver Jarrett Boykin pulls in a pass as Philadelphia Eagles cornerback Cary Williams defends. Philadelphia Eagles defensive end Cedric Thornton blocks a pass by Green Bay Packers quarterback Scott Tolzien. Philadelphia Eagles cornerback Brandon Boykin intercepts a pass intended for Green Bay Packers wide receiver Jordy Nelson. Green Bay Packers quarterback Scott Tolzien.tries to tackle Philadelphia Eagles cornerback Brandon Boykin after throwing an interception. Philadelphia Eagles running back LeSean McCoy gets a little twitted up by Green Bay Packers outside linebacker Mike Neal and defensive end Johnny Jolly. Green Bay Packers quarterback Scott Tolzien gets a pass knocked down by Philadelphia Eagles defensive end Vinny Curry. Green Bay Packers quarterback Scott Tolzien throws over the defense of Philadelphia Eagles outside linebacker Connor Barwin. Green Bay Packers punter Tim Masthay gets a punt off under pressure from the Eagles. Green Bay Packers cornerback Micah Hyde gets taken down on a kickoff return. Green Bay Packers quarterback Scott Tolzien tires to get away from Philadelphia Eagles outside linebacker Connor Barwin. Green Bay Packers quarterback Scott Tolzien gets sacked by Philadelphia Eagles outside linebacker Connor Barwin. The Philadelphia Eagles call a young Ozzy Osbourne play. Philadelphia Eagles wide receiver Riley Cooper celebrates a touchdown. Philadelphia Eagles defensive back Roc Carmichael breaks up a pass intended for Green Bay Packers wide receiver Jarrett Boykin. Green Bay Packers wide receiver Jordy Nelson tries to control a pass in the end zone as he hits the ground. After a red flag challenge the catch was ruled incomplete. Packers coach Mike McCarthy and Green Bay Packers wide receiver Jordy Nelson react to a catch by Nelson in the end zone for a touchdown being call incomplete on a red flag challenge. 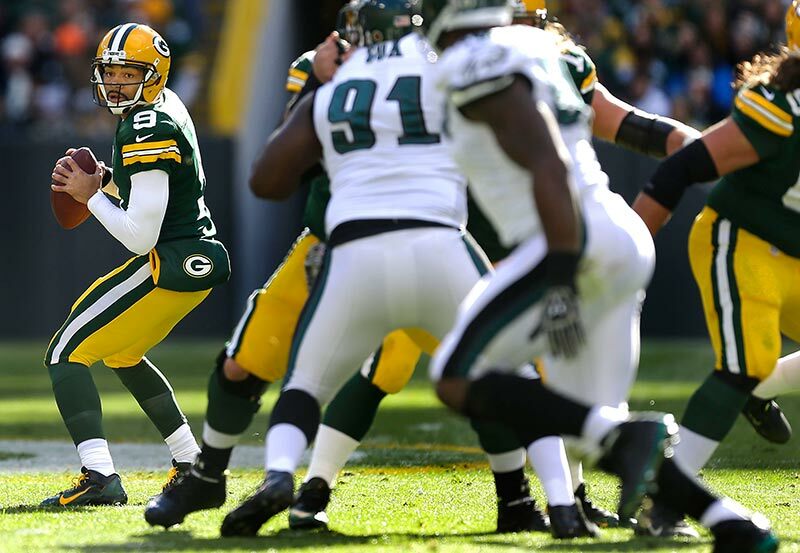 Green Bay Packers cornerback Tramon Williams picks up a fumble from Philadelphia Eagles quarterback Nick Foles. 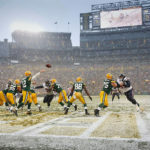 Green Bay Packers wide receiver Kevin Dorsey and injured quarterback Aaron Rodgers look on in the final minutes of the Packers lose to the Eagles. Philadelphia Eagles running back LeSean McCoy celebrates with fans after the Eagles defeated the Packers.